Tel Aviv is a city of transformation using the latest automation in the world. The most tech-savvy business owners from all over the globe come here to transform business and investing. It is our goal to help young companies and experienced branded companies succeed. With our corporate sponsors and government, we want these companies to succeed. We do this by removing all the red tape and make it easier for to run a business. Everything comes into play, here. From local support to tax breaks. We put the business owner first, knowing that their success is our success. We know that our future is dependent on research and development. R&D is cultivated by startups and it’s this innovation that we want to encourage. Not only do we make running a business easier, we have some of the most beautiful beaches in the world. So contact us to see how we can assist you and your endeavors. It has long been known that Silicon Valley is the start-up capital of the world, but many do not know that Tel Aviv is moving quickly up the ranks and rivaling the northern California hub. This is accomplished by allowing intelligent and creative young minds synergize to create innovative ideas. By providing the environment that aspires to create success, the Wall Street Journal named Tel Aviv as the second most innovative city in the world. We have taken many strides to make our city and environment for success. 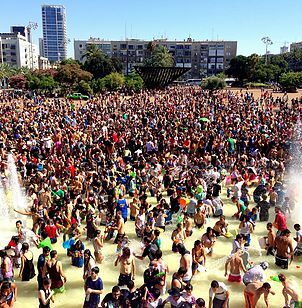 In addition, Lonely Planet named Tel Aviv as one of the top three tourist destinations in the world. We are a bustling city at the center of global business and we invoke an environment for success. We welcome startup companies and well established tech companies to visit our beautiful city. With some of the most gorgeous beaches, cafes and urban environment, we are sure you’ll never want to leave.